This week we’re celebrating 50 years of BASIC. Eben’s written a port of the popular number tile game 2048 in a BBC Basic emulator, which he shared in yesterday’s blog post. Also, RISCOS now has a “boot-to-BASIC” mode! Linux Voice #3 is out now – featuring a review of Alex Bradbury and (Linux Voice editor) Ben Everard’s book Learning Python with the Raspberry Pi. Ryan’s budget robot kit campaign ended this week – raising a great £3,770. Robot kits will be available to buy soon. 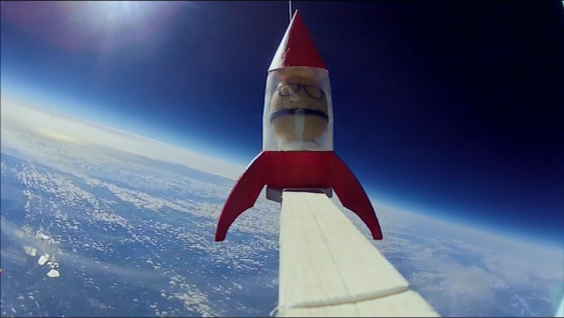 Dave Akerman sent a potato in to (near) space for the Great British Food TV series with Heston Blumenthal which aired last night. Today Pete Lomas is speaking about the industrial application of the Raspberry Pi at the University of Manchester event UMSSCC 2014. There’s also 50% off all Raspberry Pi ebooks from O’Reilly (DRM free) – including the wonderful Adventures in Raspberry Pi by Carrie Anne Philbin.